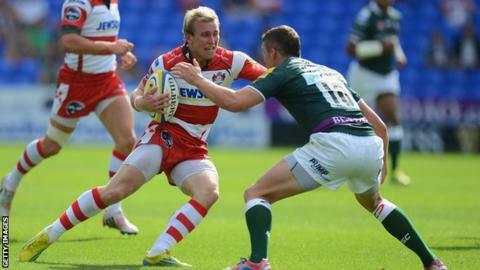 Gloucester scrum-half Dan Robson says he is relishing being involved in a selection battle with Dave Lewis. Despite his relative lack of senior experience, Robson has started both of Gloucester's opening Premiership fixtures - against Northampton and London Irish - ahead of Lewis. But he sees the ongoing rivalry as mutually beneficial. "Davey and I are really close, we work really hard together," the 20-year-old told BBC Gloucestershire. "He is a couple of years older than me so he has given me a lot of experience. We are both looking forward to Jimmy arriving. You can't learn off anyone better than someone with 50-odd caps for New Zealand. "He passes a lot of good info down and I appreciate it a lot, but it is nice to be given a starting chance and hopefully take it." Lewis has risen through the academy ranks at Kingsholm after initially joining from Exeter in 2007. The 23-year-old soon broke into the senior squad and made 20 appearances last season as a back-up for Rory Lawson, who left the club to join Newcastle in the summer. Meanwhile Robson, who represented England at Under-18 and Under-20 level, made his first-team debut last season after also graduating through the academy. After impressing for Hartbury, he thrived on senior duty at the Premiership Sevens in July. Competition will become tougher for both Robson and Lewis with the arrival of All Blacks scrum-half Jimmy Cowan, who will join the Cherry and Whites after his commitments in New Zealand have ended. However Robson remains unfazed and is relishing a chance to gain even more experience. "We are both looking forward to Jimmy arriving," he added. "You can't learn off anyone better than someone with 50-odd caps for New Zealand. "We are pretty excited, but obviously at the start of the season it's important for us two to take our chances as well."